Welcome to Brain Lag! We are a publisher of fantasy and science fiction novels based out of Milton, Ontario. With a focus on personalized attention and custom design elements to our books, we strive to bring mainstream publisher quality to the small press. For more information about who we are and what we do, please visit the links at the top of the page. 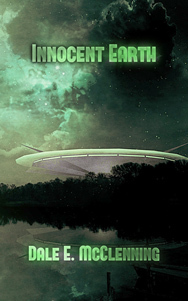 Introducing Brain Lag's twelfth title, Innocent Earth by Dale E. McClenning! This compelling science fiction novel mixes first contact with ancient prophesy and a cast of fun characters trying to survive the changes coming to a future Earth. Also, stay tuned to our event calendar and social media pages, because we're always adding new events!